In the coffeehouses, they used to lead Jose Feliciano in and he used to sit on a stool and pet his seeing eye dog and put his guitar on his knee and do his stuff. Jose Feliciano has always played a great guitar and he has al­ways molded everything he sang into his own style. The teenyboppers hadn’t heard of him then. It took a song called “Light My Fire” to put Jose Feliciano on the musical map. That, like many of the things he had done be­fore, was just his own stylistic version of a song made famous by someone else. In this case, it was a group from California called The Doors. A lot of people bought that record and made the name of Joe Feliciano fairly well known. It was well known enough anyway to have somebody ask Jose Feliciano to sing the “Star Spangled Banner” at the start of the fifth game of the World Series in Detroit Monday. Now anybody who knows the first thing about music will tell you that “The Star Spangled Banner” is bad news. Its tough to sing and it’s tough to remember. You don’t have to tell that to Robert Goulet. He blew the whole thing in front of the entire country at the second Liston-Clay fight in Lewiston, Maine. Well, the only thing outlandish about the whole affair is that people can really get up tight when they hear that particular song sung with some feeling. You just can’t get away with it. The alleged patriots of this country are just too used to sliding the beer can under their seat and standing in a half-slouch and moving their lips as if they knew what they were sing­ing while some maintenance man slips a rec­ord arm on a scratchy old recording, or some fat soprano warbles her patriotic head off. And when it’s over, they all cheer and whistle because it’s out of the way and now they can go about watching their baseball game with­out interruption. These are the people who are outlandish. After he finished Monday, somebody asked Jose Feliciano why he sang the song the way he did. Jose Feliciano did his own thing and the patriotic Americans who drink all the beer and lay all of the illegal money on whoever pays the better odds got all upset because somebody stuck a raisin in their apple pie. Last month, somebody in New York stole Evan Des­sasau’s idea, right down to the name, and held a Miss Black America pageant in Madison Square Garden, on national television. It was enough to break Dessasau’s heart, not to mention his wallet. He had a briefcase full of papers showing that his was the real thing. It didn’t matter much, though, because the real thing was nothing more than a second-class bomb that didn’t even go off on time. There were only three girls, for reasons of health, in the finals, with maybe only 30 people in the audience. It was a real slipshod operation. “How many judges are there going to be?” we asked Evan Dessasau before the finals. They weren’t. We walk past the dusty old couches on the second floor of the aging but rustic Berkeley-Car­teret Hotel, to the Crystal Room, a modest Victorian ball­room done up in red and decorated with three giant crys­tal chandeliers that weren’t so clear anymore. There are five young black guys in the corner, blasting some good soul music. They, are competing with the clanking of dishes from the kitchen next to them. They finally won out, but it was a long battle. The judges come in and sit at a table on the other side. There are five of them, alright, but one of them is a white man. He is wearing a gray shirt with double patch pockets, the kind a cop would wear. He looks like a cop. We figure he is the chief of the Asbury Park police, that Dessasau was wrong about his color. The pageant goes on for a very long time. Now, it is near the end. The judges leave the room to vote for a winner. They are gone for a very long time. There is no secret ballot, no point system. They just go into a room off to the side and argue it all out. It is between Miss New Jersey and Miss Michigan, the crowd is saying. Miss New Jersey is very Afro looking. Miss Michigan is very white looking. The judges come back, some with very serious faces. The white man is smiling. He slammed down the mint phone receiver in the plush staff suite and huffed out to the 28th floor express elevator to the velvet lobby of the Penn-Garden Hotel and out into the heat of 7th Ave. where the heavens hung heavy with whimpering clouds. He darted the group buses on 31st St. and took the plaza steps two at a time to the main entrance of the new Madison Square Garden. He zipped past the women in the white blouses and long black skirts and the gray hair in buns, and the men in the baggy black suits and the white socks and he did not stop to hear what they were saying. The guy in the dark green suit kept flashing his staff pass at the security guards all the way up to the first promenade and into the Crusade office where he found his man. It has been 12 years since Billy Graham, evangelist, had been in New York, the sin capital of the Western World. Time had made things curiouser and curiouser. Graham had to come to the Garden to help clean New York up. On the opening night of the Crusade, about 25,000 believers and seekers showed up to have their souls sweat by a new broom. Graham, his wavy golden-gray hair sitting on top of an iron face of pancake makeup, was overwhelmed at the welcome. “It’s one of the largest, if not the largest response we’ve ever had on a first night,” he said. Overwhelming was the word for the whole thing. There was a 2,000-voice choir, pared down from 3,000 applications. There was someone in every seat in the place and some in places where there weren’t seats. There were old men and women after their last sal­vation. There were young men and women seeking the right road, seeking a spiritual saviour. “HE’S HERE,” one of their buttons said. Cliff Barrows, Crusade music and program director, warmed the crowd up with a fast hymn from the Official Billy Graham Song Book (only 50 cents at an usher near you) and then introduced Graham. The last time Ralph Abernathy was in Trenton, the bearer of Martin Luther King’s torch said last night, it was a hamlet. Now, he said, it is strong a sprawling metropolis. It was a long ride in from Philadelphia, and it was very dark and stormy. Ralph Abernathy was very late. Obviously, he had not been spending the time touring Trenton. The place Ralph Abernathy called a bustling metropolis sent him away with a big $319 and a whole lot of loose change. It came to about a buck a head. And although the passing of the plate didn’t bring in very much money at the War Memorial Building last night, it did prove a point of sorts. Critics of Ralph Abernathy have, for a long time, called him a two-bit country preacher. Not so. Last night Ralph Abernathy came to the “big city” and pulled in eight bits a head. He walked into the first big local SCLC meeting to the music •of cheers and shouts. The chorus was singing “Oh, Happy Day.” Local SCLC President Edith Savage was yelling “Abernathy is the leader” over and over again. It was a real revival. Abernathy is a short man. He doesn’t have the physical presence of Martin Luther King. He doesn’t have — you should pardon the expression — the charisma. He is no longer the champion of the dungaree jacket — the symbol of the poor people’s march, the cloth of Resurrection City. who was not wearing the tie — had on a purple suede jacket. Things seemed to be looking up. Somehow, the poor people’s campaign doesn’t seem so poor anymore. Ralph Abernathy went into what he calls his “Baptist swing.” It is a pounding, driving message that speaks of the Lord, that makes people in the audience shout out “amen,” that makes him sound like a black Billy Graham. Most of all, it is the device that brings in the bread. It is a device that gets the people in the audience jump ing to their feet and reaching in their hip pockets and pulling out the folding stuff. The thing that Ralph Abernathy learned in all those years with Martin Luther King was how to wake them and shake them. Ralph Abernathy got them off their knees alright. He got them off their knees, .and he stood them on their heads, and he shook them until the change fell out. He started with the tens, and he got down to the fives, and then he settled for the ones. “It doesn’t look like he’s going to pull in a fortune tonight, “one of the white-jacketed ushers said. The sprawling metropolis of Trenton that Ralph Abernathy had come to revive had suddenly gone back to being the hamlet it always was. He finished speaking, and they sang, “We Shall Overcome,” and everybody walked outside. It had stopped raining, and the clouds had lifted, and in the still of the night you could see things a lot clearer. You could see the light. There is something to be said for arrogance. There is something to be said for the arrogance of Joe Namath. It is the same thing that should have been said for the ar­rogance of Muhammad Ali. There is something to be said for the arrogance of this whole generation. It was arrogance that made this country. It was the arrogance of a small and explosive group of rebels who spit in the face of Mother England and made America. Now, in the America they started, their arrogance has been forgotten. It has been replaced with the complacency of quiet conceit. Through injury to his pride and prejudice. Lyndon Johnson, man of the thirties, is leav­ing and being replaced by journeyman politico and loser Richard Nixon. America, the Baltimore Colts, has finally kissed the crewcut of Johnny Unitas good­bye, only to welcome the weary and colorless arm of Earl Morrell. FOR AMERICANS who like their brand of politics 100 yards long, it is as simple as this. The only reason Earl Morrell replaced Johnny Unitas is because Joe Namath was killed last June. The symbolism here is devastating. Johnny Unitas is played by Lyndon Johnson. Earl Morrell is played by Richard Nixon. And Joe Namath is played by Bobby Kennedy and the hope for America. The America of the Revolution was the New York Jets. The America of the present is the Baltimore Colts. The arrogance of the Revolution has atrophied into quiet conceit. We have raped Mother England because she deserved it and have turned around to dare anyone to stop further carnal pillage. Quiet conceit has made America what it is today. Only arrogance can change it. YOU WILL FIND the juxtaposition of arrogance and quiet conceit just about anywhere. There is something strange about it though. Arrogance is an absolute. It is s definite attitude. You know when somebody is arrogant. Quiet conceit is like creeping mediocrity. It is fat-catism. It is the desire to sit back on your fat laurels and blow back at the winds of change. Quiet conceit is the family newspaper that sits back and watches the world go by in journalism, with the addition of weak sister journalism. Don’t milk the sacred cows. Don’t knock the estab­lishment. Be nice to the advertisers. Arrogance is telling it like it is. Period. There are two revolutions in America to­day that are spitting in the face of quiet conceit. The student revolution and the black revolution. Both are born of arrogance. Each has common goals. Their target is the Baltimore Colts. THERE ARE PROBLEMS inherent to revolutions against the establishment. The major problem in overcoming the establishment is obvious. Most of the time you are shooting water pistols at the iron plate. The wars of revolution cannot be fought with tin soldiers. For the people who don’t know any better, for those who are products of their society, the answer is violence. It is the violence that has brought about all of the “student unrest on campus.” It is the violence that has canon­ized such anti-saints as Stokeley Carmichael and Rap Brown. It is the violence of the small and fierce underdog clawing away at the fat cat. Joe Namath could have taken his Jets on that route. They could have scrapped and fought and showed everyone how tough they were and that they really didn’t deserve to be such big underdogs because they were really a good football team. That would have been the route of quiet conceit. One problem. The Jets didn’t have anything to be quietly conceited about. They won it with arrogance. Johnny Unitas has had Namath beat since the fifties. Joe Namath got $10,000 for shaving off his moustache. There is something to be said for arrogance. Suzanne, a wild-looking blonde who seemed significantly less than 21, was stuffed into a very short black dress without a back. There was clearly no room for underwear. 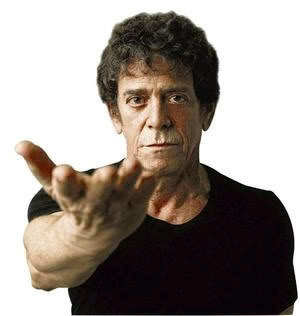 Her friend George wore a T-shirt that said: “In Lou We Trust.” They had come, by bridges and tunnels, all the way from Brooklyn, Lou Reed’s home borough, in the hope they would enjoy the show. Lou Reed, who has been around a few times, and then around again, is on stage wearing a black leather vest (the night is too hot for his black leather jacket) and a Harley-Davidson T-shirt. He is singing the song that made him what he is today—an enigma. Take a walk on the wild side .. .